We hand select the finest available materials to create the Aura One. Rare Californian burl wood is used in the handle because its isotropic grain provides strength in every direction, minimizing shear and compression under the hand. Dense gemstones are finely tuned counterweights, providing ideal working balance for the Aura One. A layer of black palm, with its strong grain laid diagonally into the tang, provides a powerful coupling between the handle and the blade. And finally, Aura Stainless steel furnishes the 9.5” blade with peerless edge retention and strength for the professional chef. Aura Stainless steel is the result of years of metallurgical research. Crafting perfect steel is an art that requires patience and a commitment to achieving the finest balance between hardness, edge-retention, ductility, consistency and corrosion resistance. Aura Stainless is crafted using more than 30 steps and provides phenomenal sharpness and edge retention for the professional kitchen while retaining corrosion-resistance for a lifetime of use. Working hand-in-hand with professional chefs, we created a unique satin finish for Aura Stainless steel, designed to reduce glare form professional overhead kitchen lights and to provide an optically color-neutral surface for chefs to focus clearly on food for precise cuts and presentation. A knife handle must deliver a fine combination of power and control. Think of balancing the large, powerful grip of a baseball bat with the small, control grip of a surgeon’s scalpel. The Aura One’s3D handle is a triumph of design, the result of 4 years of intensive development and beloved by the chefs who use our knives worldwide. The contoured handle sits comfortably in the hallow of the hand, reducing muscle strain for long hours of knifework and supporting the hand in both pinch and classic grips. The Aura One’s bolster, tang and finger choil are designed to provide ergonomic leverage for push, pull and twisting cuts. The combination of edges and curves in the handle are designed to provide the chef with unmistakable feedback on the position of the knife in the hand, allowing for more intuitive and precise knifework. Each structure in the Aura One handle has been designed by observing and consulting with chefs, so our signature handle has truly been “designed by chefs, for chefs”. The new Aura One blade is longer yet lighter and thinner than its predecessors thanks to the unique strength of Aura Stainless steel. The result is a knife that provides a luxurious 9.5 inches of working edge but still feels nimble and lightly balanced in the hand. The Aura One blade features a progressively rockered profile: an advanced geometry developed over 4 years of Aura research. For slicing cuts, the curved edge promotes smooth initiation, concentrating power in the right phase just past the initial incision. For push cuts, the rockered blade gently accelerates the knife into the cut, allowing for a strong finish close to the hand where power and control are maximized. The blade is designed to provide a low-impact finish to the cut, promoting better rebound and less impact fatigue on the arm. A 5-degree, swept-back heel places more working knife edge under the chef’s hand where power and control are maximized. The result is more powerful and precise cuts with greater feel and less fatigue: push-cuts finish with more power and slicing-cuts are initiated with more control. The swept heel has been designed to minimize “catching” on food and to allow for normal sharpening practices. The new Aura One features a taller blade (2” height) that allows for more knuckle clearance and easier scooping of cut foods. The added height also ensures that the Aura One will last through lifetimes of sharpening for professional chefs. To reduce friction from the added knife height, we developed a nonlinear blade profile for the new Aura One which encourages food to peel gently from the cutting edge, promoting cleaner cuts with less blade resistance. 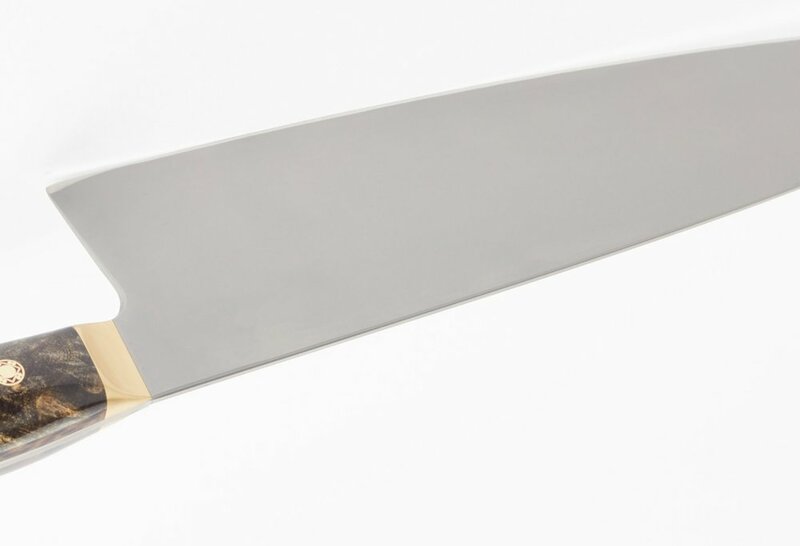 Additionally, the satin finish of Aura Stainless has been developed with a light texture to reduce resistance (and in particular stiction or “static” friction) with food products against the blade. The Aura One features a symmetric, double-beveled edge. The thinness of our new blade has allowed us to rival the sharpness of single-beveled blades without its significant drawbacks (such as folding edges, “leaning” cuts, lower edge retention and faster wear). Historically, knife handles were held together with through-hole pins, giving rise to the classic 3-pin knife design. While the Aura One uses far stronger aerospace-grade bonding for our handles, we continue to use mosaic pins in a symbol of respect for the thousands-year history of knifemaking. The Aura One mosaic pins feature the simple interactions of circles with a square: and expression of the clear geometric fundamentals underlying the harmony of the knife’s unique design.